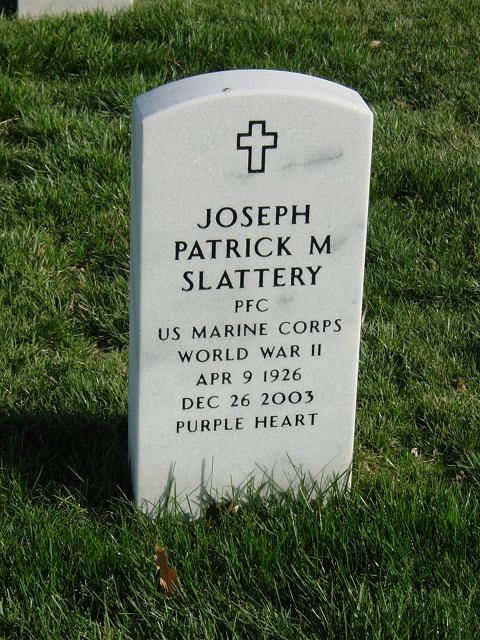 Joseph Patrick Michael Slattery, a former North Massapequa, New York, resident who received a Purple Heart for his valor during the battle for Iwo Jima during World War II, will be buried at Arlington National Cemetery in Virginia on Tuesday. Slattery, 77, who worked as a painter for the Port Authority for almost 40 years before he retired in the 1980s, died December 26, 2003, of a heart attack at his home in Blacksburg, Virginia. Born in Brooklyn, he joined the Marine Corps at 17 and became a machinegunner with the 4th Division in the Pacific. "The Marine Corps was the most important thing in his life," said daughter Patricia Ann McAlpine of Centerport, New York. "He was well known around Blacksburg because his license plate read 'IWO USMC.' But he never talked about the war and he never said why." The only detail of Iwo Jima that his children could pry out of him was that he and two other Marines held a hill the Japanese were trying to recapture one night. The three fired so many bullets, he said, that the Japanese must have thought that there were a lot more Marines, or else they would have been overrun. After the war, Slattery went to work for the Port Authority in 1947 as a painter, primarily working on bridges and vehicles. While working on the Lincoln Tunnel in 1949, he and his crew were summoned to the Holland Tunnel to help after an explosion of chemicals that fell off a truck, injuring 66 people. He later received an agency medal for his actions that day. He was a member of the Marine Corps League, Sunrise Detachment, in Massapequa. After he retired and moved to Virginia, he became an officer with Disabled American Veterans Chapter 29 in Christiansburg and volunteered at a veterans hospital in Salem, Va. He also was active with the Marine ROTC cadets at Virginia Tech, helping to organize the Toys for Tots drive for many years. His wife, Anne Testada Slattery, died in 1994. Besides McAlpine, he is survived by two daughters, Mary Ellen Slattery of Northport and Laurie Slattery of Centerport; a son, Joseph J. Slattery of Blacksburg, Virginia; and seven grandchildren.